Two friends, found of horror and gore, hear about a game called Brainscan, supposed to be like none they experienced before. After Michael’s first try of the game, he quickly understands that Brainscan is more than just virtual reality. 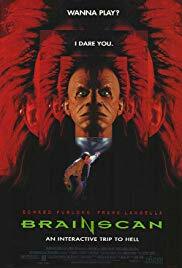 Brainscan could have been such a better movie. It mixes teen horror and sci-fi horror, playing around the theme of horror virtual-reality and videogame. 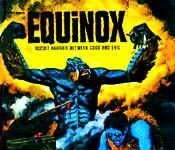 This, along with a great introduction of the characters, multiple references to earlier horror films and lots of heavy music, makes the beginning of the film quite exciting. The introduction into the game is spectacular, with a really brutal first kill, especially the scene with the cutting of the leg. Unfortunately, the rest of the movie is not as good, and the film quickly turns into another of these cheesy 90’s horror. Romance, friendship, cheesy morale…all this really spoiled my film and overshadowed the scare good horror scenes (90’s is one of the worst period for horror movies in my opinion). Brainscan also suffers from its old age. In 2013, looking at a 8-bit giant computer as a piece of ultra-modern equipment is difficult. The acting is of the main character, played by Edward Furlong (Terminator 2, American History X) is probably the best thing in this movie…especially considering the mediocre performance of the bad guy, who tend to be extremely irritating! The end is really lame and concludes a movie which, for me, is entertaining but disappointing.